Police in Vermont believe a 12-year-old girl was communicating with a stranger on MySpace before she disappeared on Wednesday morning. An amber alert has been issued for Brooke Bennett, of Braintree, after she convinced her uncle to drop her off at a convenience store so she could visit a sick friend, but instead police believe that she made up the sick friend in order to meet up with the stranger. After the drop off, surveillance video shows Brooke leaving the location and walking away from the store. Previously, under her father's supervision, Brooke had set up a MySpace account, but dad later pulled the plug after he learned of some of her activity. Later, unbeknownst to him Brooke set up a new account using a different computer. Brooke is 12-year-old. 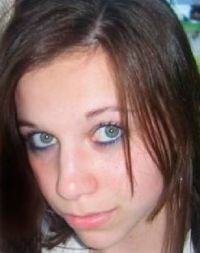 She is 5'3", 98 pounds, brown hair with purple highlights and blue eyes. She was last seen wearing blue jeans, a pink sweater and white sneakers with pink lettering. For more information on her click here.